Sean and I took a roadtrip out Route 6 through Pennsylvania back in April and along the way we passed through a small town called Coudersport. We passed this old abandoned house, and of course we had to stop and photograph it…What a shame that it has been left to rot. Old Hickory, as it was known, was a tavern, inn and restaurant once upon a time. Now it is a home for pigeons, rats and whatever else might lurk there. But it is still beautiful! 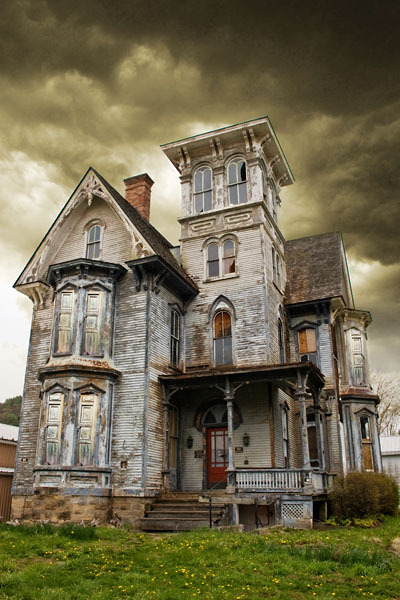 I love old houses, they have so much personality and soul to them! New houses are built quickly and with so little care…they are not a far cry from being mass produced and they just seem to be lacking the character of the older homes. I would much rather have an old home with it’s uneven walls and floors that has a life of it’s own than to have a new house with drywall and plywood. It’s absolutely gorgeous. What a shame! It sure is, Kimberly! 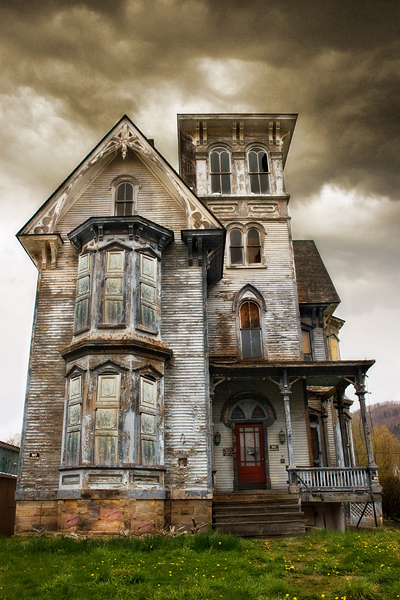 I would love to live in a restored version of this house! could you imagine having a bedroom up in the very top of the tower? with windows to view the world all the way around at night??? that would be an awesome way to fall asleep! this inn was massive! my photos don’t even do the size of it, justice! Tracey, I love that you can find the beauty in so many things other people cannot see. This is gorgeous. I am hopeful someone buys it and restores it to its original condition. Since you have so much history on it, do you know if plans are underway to restore it? BTW, just found this site quite by accident. Didn’t know it was here! Hi Carolyn. Well I am so glad that you stumbled across my site! And thank you…..Yes, you are so right, this house is just simply amazing! I read an article from 2008 or so that said that there was so much outcry about the state that they let this building fall into, and that the town of coudersport said that they were to have the building renovated within the year……but it was only this year that I photographed the building, so unfortunately it seems that those plans fell through….what a tremendous loss they will have once this building gets to a point where it is no longer a viable renovation project and the only option will be to condemn it and tear it down. 🙂 no! I didn’t have that! thank you for sharing! I didn’t know that Eliot Ness had drank there! That is an interesting fact as well as all the others! That would make an awesome studio! And thank you, Adrienne!